Let’s Meet Cody Bass! | Not Your Average Hockey Blog. We recently caught up with Cody Bass of the Springfield Falcons. He’s a high energy forward who can “bring some emotion to the ice”, but I’ll let him explain it. 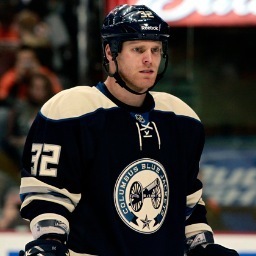 He was drafted in the fourth round of the 2005 NHL Draft to the Ottawa Senators. He’s only played one NHL game this season, but he’s already had his first NHL fight of the season as well! http://www.youtube.com/watch?v=mtcFsh2xVZI (stick tap to HockeyFights.com for that one.) Make sure to follow him on Twitter as well @cbass2632. Follow us on Twitter: @HkyBlogger, and “like” us on Facebook here: https://www.facebook.com/NotYourAverageHockeyBlog. Without further to do, we are proud to release our interview with Cody Bass. Editor’s note: Make sure to read the last question. His response really makes you think. I didn’t expect such an emotional answer, and I’m glad he chose to answer with such emotion. What’s a day in the life of Cody Bass? Haha well my days are usually not too exciting, I basically wake up, practice, lunch, walk my dogs (which are crazy so its not that easy) relax or run errands with my girlfriend, dinner and walk the dogs.. The dogs consume most of my girlfriend’s and my time. Game days are also a bit different as well. Before you were drafted, you won a silver medal in the 2005 IIHF U18 World Championship. Where is the silver medal now? Do you wear it every now and then? My silver medal is at my mom’s house where she keeps all my hockey stuff in a room. It actually might be frame with my jersey so no, I don’t know where it is. I like to consider myself as a hard working energy type player. i like to play a physical game an bring some emotion to the ice. You’ve been in a fair share of fights. What kind of rationale do you have to getting punched in the face repeatedly? Fighting is part of the game. Its an aspect of the game that I bring. I play with a lot of passion and emotion so its something that I do. Do i enjoy it? Well does anyone enjoy getting punched in the face? No, but again its part of the energy that I bring to my team. Its part of my job. You were drafted in the fourth round in the 2005 Draft. Tell us about it. What was it like? Where were you, who did you hug first? Getting drafted to Ottawa was an exciting day for me and my family. I was at home watching the draft with my family on TV. Once I saw my name I was excited and gave my mom who has been my biggest supporter a big hug. Getting drafted by a Canadian team was also the cherry on top. What is it like getting called up? Take us through it? Well I have been playing pro for 7 years now and my goal is still to play in the NHL. Anytime you get called up its super exciting. To be given the opportunity to play in the NHL is always amazing and I’m grateful for every opportunity I get. What’s the biggest difference between playing in the AHL and he NHL? The AHL is almost harder to play in than the NHL. You actually have less time and space in the AHL. Its basically a swarm of bumble bees flying around at a million miles per hour trying to hit each other. Everyone in the AHL has something to prove and at the end of the day everyone’s goal is to play in the NHL so guys have something to prove. The NHL is more controlled. Guys are not so much faster but they move the puck faster which increases the speed of the game. Everyone plays with control and respect in the NHL which makes the game almost easier at times. Crazy I know. What is your biggest strength and what is your biggest weakness? Strengths and weakness? Well I feel I’m a great skater and play an honest gritty game. I consider myself a smart hockey player… I probably lack in offensive instincts but also that’s not the type of game I play. The next part is more of a rapid fire round. It’s wear fans learn more about you as a person and not just as a hockey player. Ready? Coolest place in Springfield to hang out at? Max burger or Costco haha. Weirdest thing a fan has ever asked you to sign? I have never signed anything weird. Do you get noticed on the street often? We interviewed your teammate Sean Collins a while back, any secrets or funny stories about him? Haha Sean is a good guy I won’t embarrass him. My advice for young hockey players is that hockey is just a game. Life does not end with hockey. With the tragic event of Terry Trafford, I hope every kid just lives their life to be happy. Being happy is the key to life. I wish that every kid who wants to play hockey for a living will go to school and get an education. Use hockey for a scholarship. Go experience life and enjoy what life has to offer you. Pro hockey will always be there. Don’t make sudden irrational decisions. Love the people who are closest to you. Respect everyone and don’t judge a book by its cover. Everyone has a story to tell and everyone needs someone to talk to once in a while. Work hard at everything you do and good things will come.